In the 2015 Coach's Handbook presented by inside Cheerleading & CheerBiz News MatsMatsMats.com is featured as a supplier of cheerleading mats and equipment. Featured on page 32, 55, 64, and 70 in the Christian School Products 2015 Buyers Guide publication as a source for athletic equipment mats, classroom equipment and supplies (classroom area rugs), facilities supplies (carpet and flooring). 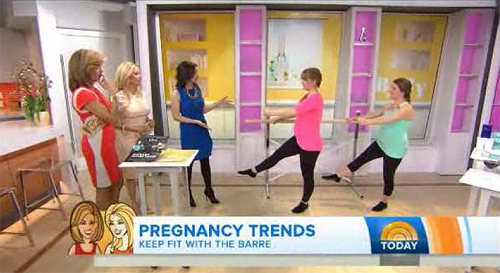 On March 7, 2014 our Free Standing Ballet Barre was featured on the Today show. Lori Richmond, editor of TheBump.com, talked about pregnancy trends. 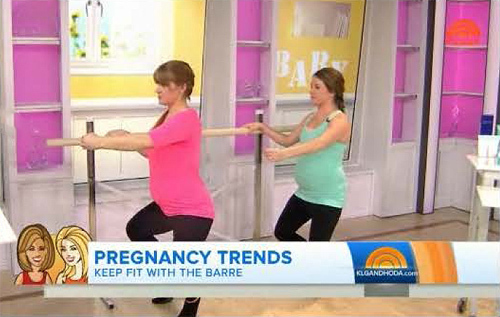 One of those trends is moms doing a low impact, full body, hot maternity workout - the bar method Xtend Barre version. Featured in the Equipment and Supplies section of Inside Gymnastics Magazine's 2013-2014 Coach's Resource Guide. Featured as a cheerleading equipment and supplies resource in the 2013 Inside Cheerleading and ChherBiz News Magazine, the 2013 Coach's Handbook edition. Featured in the Christian School Products 2013 Buyers Guide publication as a source for carpet and flooring. Featured in the Equipment Section of the 2012/2013 edition of the Dance Director's Survival Guide - The Essential Resource For Dance Team Coaches. Article entitled Eco-Friendly Rubber Flooring For Sports and Play was featured in the January 2012 Green Living Magazine. On January 3, 2012 MatsMatsMats.com was featured on the Jackson Truth Radio Show, on LA Talk Radio, as the source to "get your mats for the gym, home and office... quality mats at great prices. It's a new year, so get the exercise mats and use the mats - and not just for holdin' up the wall..."
Featured on page 30 of Cheer Coach Magazine's 2011 Directory and Buyer's Guide as a supplier to the cheerleading industry. Our Bounce Back Safety Playground Surface (made of eco-friendly recycled rubber tiles) was featured on page 16 of the September 2011 edition of School Play Magazine, which focused on choosing the right playground equipment. On May 7, 2011 Alex Miller, A MatsMatsMats.com sales representative, was interviewed during the Saturday morning "A Firm Foundation Show with Rick and Jackie" heard on AM1470. Among other things, he discussed the rubber flooring supplied to Pocos Playhouse (of-leash daycare environment for dogs in Ohio). To read more visit http://www.rickandjackie.net/blog/2011/05/). Once again, our products were featured on the DIY show "10 Grand In Your Hand" (a show designed to show people how to save money by doing-it-yourself). This episode, From Basement to Home Theater, followed Jeff and Elizabeth Schell as they turned their large basement into a multi-use room with a theater, a sauna, a bar and a gym. Our 2'x2'x1" interlocking tiles were used as the gym flooring and other interlocking foam tiles were used outside the sauna as waterproof flooring. This show aired on May 4, 2011. Featured on page 65 of the 2010-2011 Dance Director's Survival Guide - the essential resource for dance team directors. A February 15, 2011 article for eHow.com, written by Lisa Finn, featured MatsMatsMats.com and many of our products (such as ABC puzzle mat, Tote-N-Mat, tumbling mat and kids play mats), as a reference and a resource. Corey Colwell-Lipson from Celebrate Green shares some ways to make your New Year's Resolutions more earth-friendly. Our natural rubber yoga mat was featured in this January 6, 2010 segment about "greening" New Year's resolutions. Our SoftRubber Interlocking Tiles were featured in the Season 4 " Big Basement Workout" episode 12 of the DIY show "10 Grand In Your Hand" (forward to the 15:14 time mark) airing on December 8, 2010. The show demonstrates how easy it is to do-it-yourself and save money by using products like our ours. Featured on pages 30 and 52, as a cheer equipment supplier, in the Cheer Coach & Advisor 2010 Directory & Buyer's Guide, Your Ultimate Guide For Everything Cheer!. In December of 2009, our "Help Fight Breast Cancer" pink yoga mat was featured in the Uptown Liz Holiday Gift Guide. Provided Extreme Makeover: Home Edition : Marshall Family (Original Airdate 10/18/2009).an 8' wall mounted non-adjustable ballet bar. This was to be used for physical therapy by Carlton Marshall, a SWAT police officer who suffered disabling injuries after being shot in the neck during a 2007 drug raid. Featured on page 56 and 66, as a dance equipment supplier, in the 2009-2010 Dance Director's Survival Guide magainze publication - the essential resource for dance team directors. On August 11, 2009, David Carrau posted a very positive article about our Exercise Ball with Pump in the Product Reviews section of lose-weight-quick-easy.com. Featured in the Cheerleading and Gymnastics Equipment, Supplies & Accessories section of the 2009 Coach's Resource Guide published by Inside Gymnastics Magazine and Inside Cheerleading Magazine. On July 14, 2009, V.S. Cowen, in an article she wrote for Examiner.com entitled Getting to sleep - Part 2 (as part of the alternatives to sleep medication series), writes "Want spa quality products? Order online at www.matsmatsmats.com." Featured on page 40 and page 72 in the Cheer Coach & Advisor 2009 Directory and Buyer's Guide. Featured on page 95 in the Equipment, Supplies & Accessories section of the Inside Gymnastics | Inside Cheerleading 2009 Coach's Resource Guide. Article entitled Landfills Full Of Used Tires May Be A Thing Of The Past featured in May 2009 Green Living Magazine. Featured on page 70 in the equipment section of Dance Director's Survival Guide Magazine 2008/09. Pink "Help Fight Breast Cancer" Yoga Mats were featured on the "Products That Give Back" segment of the Today Show presented by Shape Magazine on October 13, 2008. Our pink "Help Fight Breast Cancer" yoga mats can be found on page 47 in The Breast Cancer Research Foundations 2008 Shop Pink - Guilt Free Shopping - Magazine, featuring products that help raise money and awareness for breast cancer research. Our pink "help fight breast cancer" yoga mat was featured on page 80 in the August/September 2008 edition of Travel Girl Magazine as one of "four ways you can make a difference... The Right Mat-titude." Featured as a gymnastics equipment and cheerleading mat supplier on page 79 of the 2008 Coach's Resource Guide presented by Inside Gymnastics Magazine and Inside Cheerleading Magazine. Healthy Living NYC magazine features our neoprene workout gloves and harmony natural rubber yoga mats in its Best Of 2007 - The Best Healthy has to Offer. Our yoga mats, yoga supplies and meditation cushions were featured on pages 24 and 37 in volume III, issue 3 of the Healthy Living NYC publication. Our Pink "Help Fight Breast Cancer" Yoga Mat was featured on page 46 of The Breast Cancer Resarch Foundation's Shop Pink 2007 shopping guide. Our Yoga Products were featured on page 35 and 58 in volume III, issue 2 of the Healthy Living NYC publication. Featured on page 32 of the Cheer Coach & Advisor 2007 Directory and Buyer's Guide. Our wrestling mats were featured in the 2007 Kids State Championship Premier Guide published and distributed by Team Georgia USA Wrestling. Meditation and Yoga Supplies f eatured in February/March 2007 issue of Holistic Happenings magazine. The Wall Street Journal rated our Elite home entry door mat the "best overall and best value" in an article by Charles Passy entitled Doormats Go One Step Beyond, on January 19, 2007. Featured three separate times in the "Best of Health 2006" issue of Healthy Living NYC. Our products are featured on page 23, 33 and 52. The Harmony Yoga Mat was called the best eco-friendly mat and our Yama Mat was listed as the best standard vinyl mat. Our anti-fatigue mats and entry floor mats are featured on page 39 of the December issue of Facility Safety Management Magazine. Featured in the November 19th Chicago Sun Times publication in an article entitled Your "Yoga Mat Matters". One of 5 companies featured in The Wall Street Journal on October 27, 2006 in an article entitled A New Class of Yoga Mats by Noah Rothbaum. On October 9, 2006 our Pink "Help Fight Breast Cancer" Yoga Mat was featured on The Early Show on CBS to help kick off "Pink for a Week", a 5 day segment featuring breast cancer charities and products that support them. The Breast Cancer Research Foundation's October 2006 Pink Buys edition of the Pink Press features our Pink "Help Fight Breast Cancer" Yoga Mat in the sports section. Our commercial mats were featured on page 44 of the September issue of Building Services Management Magazine. Our Yoga and Meditation products are featured in the fitness section on page 28 and page 33 of the "Julia Roberts" issue of Healthy Living NYC. Our Yoga Mat is featured on page 111 in the July 2006 issue of DaySpa Magazine. Our Yoga and Meditation products are featured in the fitness section on page 27 of the June 2006 issue of Healthy Living NYC. Our Pink "Help Fight Breast Cancer" Yoga Mat is featured in the sports section of The Breast Cancer Research Foundation's 2006 Pink Buys Press Kit... Putting on the Pink. Our Wrestling and Martial Arts Mats are featured on page 86 in issue 11 2006 of the TapOut Magazine publication. Our Yoga and Meditation products are featured on page 32 and 35 of the February 2006 issue of Healthy Living NYC. thepurplebook: The Definitive Guide to Exceptional Online Shopping has released its newly updated 2006 Edition through Time Warner Books, and we are pleased to announce that for the second consecutive year MatsMatsMats.com has been included in the current year's listing of the web's best consumer retailers. This is a completely objective directory of web shops, compiled after exhaustive research into tens of thousands of e-commerce capable sites. thepurplebook is currently on the shelves of all major bookstores across the country, and from most online booksellers. The October 2005 Edition of Better Homes and Gardens featured our pink "Help Fight Breast Cancer" Yoga Mat (page 299) in the "Shop for the Cure" section. The Fall 2005 edition of Cheer Coach & Advisor Magazine recommended MatsMatsMats.com for Cheer Floors and Training Equipment (page 38). In the October 2005 edition of Parenting Magazine our Reading In Bed Pillow (page 143) and our Pilates Resistance Tubes (page 213) were featured as "Mom-Tested" and endorsed products. Our Pink "Help Fight Breast Cancer" Yoga Mat was featured on page 134 in the October 2005 issue of DaySpa Magazine. Featured on page 34 and page 37 of the August/September 2005 issue of Healthy Living NYC. In the June 2005 edition of Yogi Times Magazine, our Yoga Ashtanga Rug was featured in an article entitled "Get A Grip... No Slip Yoga Products." Our Designer Yoga Tote Bag was recommended and pictured on page 42 in the May 2005 issue of Shop, Etc. In the Winter 2005 edition of Pilates Style Magazine, our Pilates SoftFoot Mat was featured in a spread entitled "The Perfect Mat". MatsMatsMats.com was also listed as a source for Pilates shoppers. Featured as a source for mats and equipment in American Cheerleader Magazine's "The Coach's Handbook 2005". Featured on page 56 in the October 2004 issue of Building Services Management magazine... "quality commercial & industrial mats at wholesale prices". On Page 84 of the Dec/Jan 2004 Muscle & Fitness Hers Magazine our fitness gloves were featured as the first recommendation in their "picks for fit gifts". Our gloves were also featured in Energy for Women, page 56 (Nov/Dec.) and Oxygen, page 136 (Dec.). Our "totally cool" Fitness Glovz were featured as a top gift idea in the December 16, 2003 Rocky Mountain News. Our products were featured in Energy for Women Magazine in November 2003. Featured on page 18 in the December/January 2002/2003 issue of Tone Magazine: "quality mats and props at wholesale prices." Featured on page 222 in the July 2002 issue of In Style Magazine: "on tour the [Dixie] Chicks find their "om" away from home on washable purple yoga mats (found at MatsMatsMats.com)."